The region of Tuscany has always been known for being a tourism favorite for those visiting Italy. The wide open spaces and long winding roads are perfect for undertaking a tour via motorcar, but what exactly should you see while in the area? The answer to that is simple: the many absolutely stunning villas and breathtaking gardens that are abundant in the region, for sure. The region of Tuscany has been a prime choice for the rich and famous going back centuries. The villas that stand in the area were built as homes for the celebrities of the time. Government officials, heads of massive vineyards, and powerful shipping tycoons all built their homes in the lavish and sprawling Italian countryside. The magnificent country homes that these individuals built were designed to be opulent, while still simple and rustic. They are considered the world over as some of the most beautiful residences ever constructed and have served as an inspiration for homes all over the world. The walled city of Lucca is one of the most beautiful places in the Tuscany region. The city is most famous for its Renaissance-era walls, which have amazingly survived completely intact since they were first built, and serves as the capital of the Lucca Province. Located on a fertile plain, the city has always been home to those engaged in the farming and winemaking industries and as such, some of the largest and most beautiful vineyard and villas are located here. When you are taking your tour of the Tuscany region by auto, you should make sure that you have at least a couple of these top choice villas or gardens on your itinerary. Each of these homes or gardens is historically significant, and all of them are incredibly beautiful, showcasing the true nature of classic Italian countryside architecture. In most cases, the gardens do charge a small admission fee, and most of the villas attached can be toured as part of a group for a small add-on fee. In all cases, these fees are well worth it for the incredible experience that may truly be a once-in-a- lifetime event. There are several tours that you can enjoy featuring the Villas and Gardens of Lucca with Lucca as a starting point. Located in San Pancrazio, Villa Oliva was built in the early to mid-15th century. Built by a famous architect of the region during the Renaissance, the home was intended to not only be a luxury home for him and his family, but a showcase of his talents for potential clients. The gardens that surround the home have not changed very much in the centuries that have passed since they were first designed. The gardens feature an assortment of beautiful fountains, pergolas, terraces, and even stunning waterfalls. There is also a display of rare plant species that were gathered from all over the Italian peninsula and even from outside of Italy in some cases. The path from the home to the gardens is a cypress-lined alley that opens up to a spectacular panoramic view of the areas surrounding the villa. There is also a dependence, a smaller luxury house, originally designed as a support or the main villa, includes its own luxury accommodations, a tennis court, and even a private pool. The Dependence can be rented as accommodations for your stay in the area. Located near the better-known and equally beautiful Villa Mansi, Villa Torrigiani is arguably one of the most dramatic examples of Italian Baroque architecture in Tuscany, and perhaps anywhere in Italy. The villa, originally built in the 16th century was remodeled extensively by Marquess Nicolao Santini, ambassador of the Italian Republic to the court of Louis XIV. The spectacular multi-colored façade and allegorical statues are a must-see, and the gardens are a place that you can spend hours exploring and still not see them all. The cypress trees and fountains are flanked by exotic flowers and fragrant bushes. Of course, the most notable features is the presence of a secret garden, a popular accent of the period, which has been lost at most estates over the years. The villas offer day tours on a schedule, which is posted on their website. This group of villas is sprinkled throughout the region. They were originally built by the Medici family, the most powerful, wealthy, and influential of the aristocratic families of the Renaissance. Famous for their finding of public works projects, especially those of high artistic value, the family has become synonymous with beauty and opulence throughout Italy. The gardens and villas that they created are among the most extravagant and elegant in the entire world and are well worth seeing. A scenic drive between the estates is a great way to spend several days in the region, and is particularly enjoyable when being undertaken by one of the fine vehicles in our fleet. For planning out your tour, there is no better option than Driving Guide Tours. 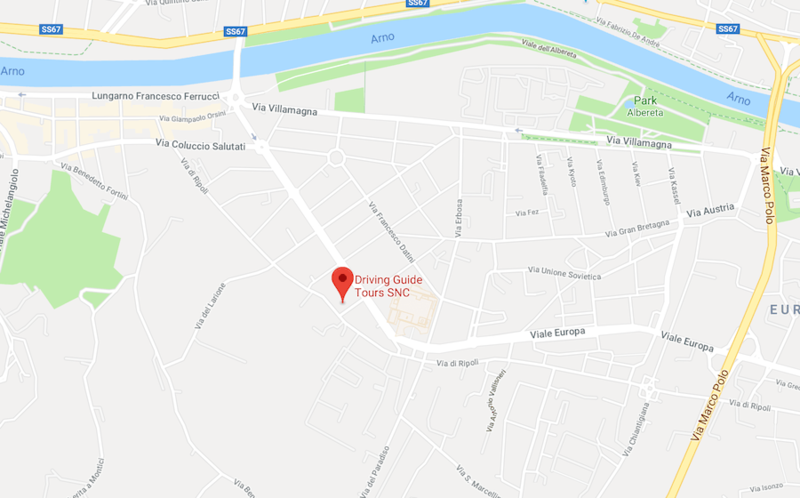 Here at DGT we offer you a great selection of top-rated vehicles to choose from, and give you all of the resources and support that you need to ensure that your driving tour of Italy is pleasant and memorable. We work with many other tour Italy providers as well to integrate a driving tour into your visit to the country seamlessly. We would be happy to tell you more about our amazing tour packages, and our fleet of exceptional luxury vehicles. You can contact us via our online chat (located in the bottom right corner of the screen), email, or via phone at +39 055-632930 (if you are calling from the USA or Canada please dial +1 866 746 4348). Feel free to explore more of our website in the meantime, and see for yourself why we are the number one provider of motorcar driving tours in Italy.